O God, you show forth your almighty power chiefly by reaching out to us in mercy. Grant us the fullness of your grace, strengthen our trust in your promises, and bring all the world to share in the treasures that come through your Son, Jesus Christ, our Savior and Lord. Amen. On most Sundays, when using the regular form for the Prayers of Intersession that come after the Creed, in that third petition in which we pray for the world (especially troubled spots), there are special prayers for peacemakers. Using language like “strengthen” or “encourage” or “sustain.” Peacemakers certainly need our prayers. When we look at the stubbornness of world leaders (no names), the complexity of conflicts, the history of tribal animosity, and all the other stuff that peacemakers come up against and are trying to neutralize, defuse, and disarm, we remind ourselves again that peacemakers really need our prayers. When we mention those peacemakers, do you have an image that comes to mind? Or do you have names that come to mind? Do you think of diplomats past and present? Kissinger, Hammarskjold, Clinton and Kerry, Gorbachev, Carter, Begin, Sadat, organizations like the UN. Or maybe the term peacemaker conjures up those who live the paradox that sometimes being a peacemaker means you have to stir the pot, shake things up, break the false peace to create true peace. If you think in those terms, then perhaps names like Gandhi, King, Parks, Milk, Mandela and Tutu, Black Lives Matter, Gays Against Guns, come to mind as peacemakers. And then there are those who work in service so that others may know peace – Mother Theresa, Princess Diana, the Red Cross, Lutheran World Relief, Doctors Without Borders. Are these the types of names and groups that come to mind when we say or pray for peacemakers? Names of folks and organizations who were or are candidates and winners for the Nobel Peace Prize? The ones who are moral equivalent of Robin Leech’s Rich and Famous. On this day, when remember those who worked for peace to end World War One 100 years ago. Also, we are remembering the antithesis of peace – Kristallnacht of 80 years ago. But as people of hope, we remember not just the tragedy and devastation of the Holocaust that followed, but also those who stood up to evil, those who resisted, those who took great risk for the greater good, those who sought to protect and save the ones were most threatened. Framed by these two monumental remembrances – one showing humanity at its peace-restoring best, one showing us at our peace-destroying worst – it is easy to think of peacemakers as these super heroes of humanity, dignity, and patience. But then in comes that poor, hunched over, easily ignored, resource-less old widow. There she is standing among the rich and powerful. They are dropping bags filled with money – symbols of their wealth and power. They drop them in the treasury at the Temple – the structure itself that shouts of opulence and importance. They drop them so that all will hear the loud thud of wealth. They do it publicly so that all will be in awe of their gift. They do it, and Jesus is unimpressed. He yawns. He lays on them no accolades, no words of praise. But then she steps up. Yes, in the midst of this garish display, this poor old widow steps up and steals the show. (Not that our giving or our service should ever be a contest, but Jesus is simply addressing the spirit of arrogance that is filling the space.) This widow has no wealth. She has no power. She has no standing in the community. She has no reason to boast as the others are doing. And yet, Jesus lifts her up as the one to be admired. As the one to be emulated. As the one who is the biggest and most faithful giver. “Out of her poverty, she has put in everything she had. All she had to live on,” Jesus says in praise of her gift. Perhaps at the treasury of peace-making, we are that woman. Sure, the diplomates and the organizations make huge contributions. (Now I’m not suggesting that they work for peace with the same spirit of arrogance that those rich folks were contributing to the Temple.) But perhaps in our smallness, in considering our potential to make a difference with our peacemaking efforts, we feel that our contributions are barely a penny’s worth. We say: why bother? What difference can I make? World War One began in August of 1914. It did not take long before the front ran all along the western border of Germany where it faced the Netherlands, Belgium, and France. No man’s land was the area between the trenches. Soldiers were living and dying in the mud and filth of this complex system of channels and tunnels. Just four months into the war, the first wartime Christmas came. Soldiers on both sides were still not fully committed to this fiasco of a war. Some were still hoping that this was going to be a quick engagement and then everybody go home. Some were still not even sure why they were out there in the first place. Germans who five months ago had been living in London and working at some of the finest hotels and restaurants, were now facing their former neighbors and customers on the battlefield. But as that heavenly peace of Christmas eve descended on those soldiers, many found they could not lift a gun. They could not shoot anyone on so holy a night. In numerous locations up and down the front, it was later reported and recounted that men on both sides came out of their trenches and met with those they had been ordered to kill. Christmas day saw them exchanging the silly Christmas gifts their respective royals had sent to them in honor of their service. Some enjoyed a friendly game of soccer. Some shared food. With no real power, with no station or standing, like that penny-bearing widow, those soldiers made peace by risking and giving all they had – themselves – for the sake of meeting their so-called enemy on the field. They couldn’t stop the war, but they could be peacemakers. At least for a day. And so it is with us. We seem powerless to stop any of the wars that wage around us. We can’t completely wipe-out racism, anti-Semitism, Islamophobia, or sexism. We can’t eradicate hatred of immigrants and refugees, or of the LGBTQ community, and we can’t simply conquer the gross disregard for the fragility of our planet. We don’t have the power. We don’t have the position. We don’t have the global attention. But, like the old widow, like the soldiers in the trenches, we can contribute out of our poverty. We can change the world where we are. As a community of faith, we are doing this. You don’t always get to see the peace that you are making through this ministry. I try to share some of what is happening. Today, I am very pleased to share the latest story with you. Luis, some of you have met him, has been one of the homeless young adults that we have been working with and offering some support to over time. Supporting folks like Luis is one of the reasons we have the LEAF fund. As for Luis, it was clear to me that he was someone who could be trusted. From time to time he would do odd jobs around the church, help Angel, and provide some extra hands. When the camp that I taught theatre at this past summer was looking for additional staff, I recommended Luis. He interviewed. He visited. And as of this weekend, he is now living and working at the camp. A little more peace has been made. In that huge temple, the widow’s contributions were small. In light of the millions who would die, on that Christmas night the soldiers’ contributions were small and way to impermanent. In this world hellbent on violence and power, hate and fear, with shooting after shooting, war after war, our contributions are tiny at best. But blessed are the peacemakers for they shall be called children of God – the God who works through the small, a widow and a prophet sharing a cake of bread, sustained by a meal jar, a savior who comes into the world as an insignificant baby and dies alone on a cross. This God who fills the peacemaker with hope to face a war-torn world. Yes, this is the God who adopts us. Names and claims at the font. Nourishes us with hope and peace at the table. Empowers and send us to sow seeds of peace wherever we go. Our seed bags are filled by the grace of God. Our seeds are sown with a smile here, a thank you there, with reconciliation and forgiveness when we are wronged, with truth telling when we are wrong. 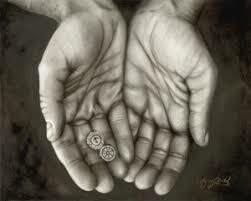 Let us commit anew to giving from our poverty and trusting in the one who assures us that, in faith, that is enough.